First Lighting offer a great range of both indoor and outdoor lighting which can all be browsed on their website. There are a great range of products to choose from and with First Lighting you are guaranteed to find the perfect lighting for any home or occasion. The brand new website design means that you can view customer reviews on the lights as well as seeing what the Star Buys are at the moment. If you haven’t already, and are thinking of making the switch over to LED lights, the future of home lighting, you can do so with the help of First Lighting, which will mean your home is altogether more cost effective. LED Lighting is renowned for using extremely little energy yet lasting for a great length of time, meaning you won’t find yourself having to replace them very often at all. Unlike energy saving bulbs that have been tried in the past, LED lights are instantly bright when turned on, rather than having to ‘warm up’ first, meaning they provide the bright effects of a regular bulb, without having the unnecessary energy wastage. LED Lights were originally associated with high prices, but not anymore, and First Lighting can definitely make sure your efficient lightbulbs are affordable. LED Lighting comes in all different shapes and sizes and there are some top quality fittings to choose from on the First Lighting website. If it is outdoor lighting that you are looking for, you can choose from an extensive list of outdoor fixtures including; decking lights, flood lights, outside wall lights, security lights, patio lights and porch lights. Aside from the obvious, lighting can serve a number of purposes, one of these being security. First Lighting has a collection of floodlights using LED Bulbs that are not only bright enough to light up your entire property but are of an attractive design, don’t get in the way and can be turned on via a sensor. Our LED outside wall lights are also a great way of lighting up your garden, these can be attached directly to the garden wall. You can browse all of the different designs on the First Lighting website. First Lighting understand that for inside your home, you may want to take a softer approach when it comes to choosing your lights. You can style your home in many different ways with their options of indoor fittings. Everything from spotlights to wall lights to under cabinet lighting can be found in the indoor lights category, all finished to a high, professional standard. If you are looking for a cosy glow inside your home, why not browse through the ‘downlights’ section. These lights can be mounted onto or underneath surfaces and although small, will provide the perfect brightness of an LED Light. First Lightings Halo range is a collection of fixtures that provide a classy ‘halo’ design around the bulb, turning the extremely efficient, bright LED light into a classy and stylish home accessory so that you can enjoy the best of both worlds. 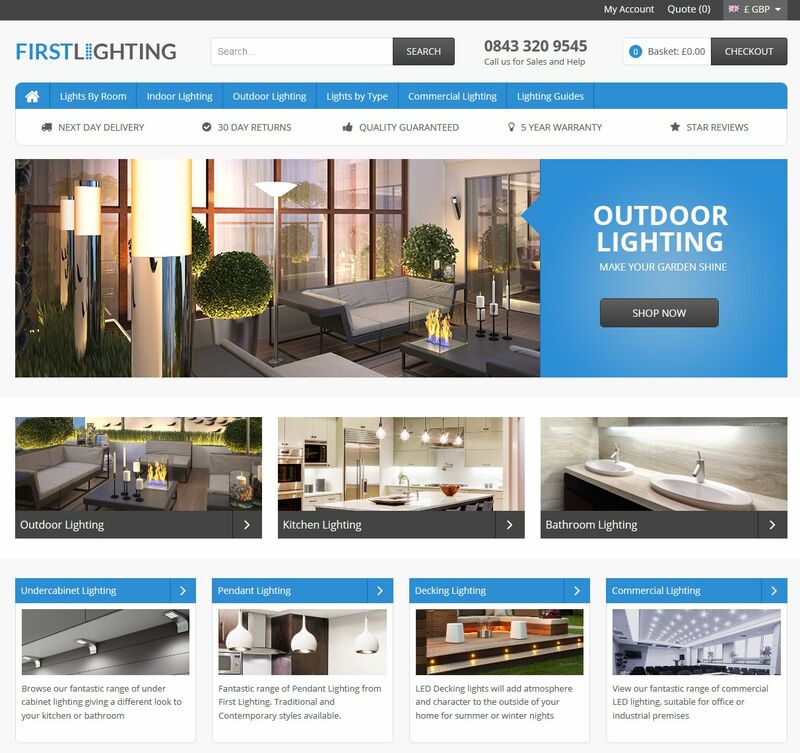 The First Lighting website offers an easy to browse design, including pictures and all the relevant information of all of their products.